I’m a beer drinker. And I don’t usually like sweet drinks. So when a big group of us went out for dinner on a weekend beach trip, I did what I always do and ordered a beer. While the waiter was getting everyone else’s drink orders, I picked up the seasonal menu and spotted a cocktail that caught my eye. Theirs was Jack Daniels Tennessee Honey, muddled peaches, fresh mint and lemon-lime soda. Since I was on a getaway weekend – at the beach no less – I changed up my order and decided to get the JD cocktail. What the heck, right? The waiter brought my drink, I took one glorious sip of it, grabbed his arm and said, “Whatever I tell you, do not let me have another one of these.” Great day in the morning, that thing was good! I could tell I’d knock the bottom out of it in no time and would want another but I had my Angel Baby with me and wouldn't want to have more than one drink knowing we’d be driving back to the hotel after dinner. It’s light and bubbly and fresh from the peaches and soda but somehow rich and decadent at the same time from the whiskey and honey. As soon as I got home I set out to recreate it! I decided to omit the mint because I really couldn't pick it up in the drink anyway and I thought ginger ale would be better with the honey so that’s how I made mine! You can buy the peach syrup at most liquor stores but I’ll post a recipe below to make your own if you can’t find it. Consider making a batch. It’s super easy and it’s ta die for in iced tea! I couldn't figure out what to call this. We've got Tennessee whiskey, honey, peaches and ginger ale. I decided to call it a Tennessee Honey Hole because JD is a Tennessee whiskey and a “honey hole” is what my daddy always called a good fishing hole or a sweet spot to put a deer stand. It means something good and special and that’s what this is! Place and scant handful of peaches and peach syrup in the bottom of a highball glass (double quantities if using a 12-oz. mason jar). Using the handle of a wooden spoon, muddle peaches in syrup (smash them up a bit). 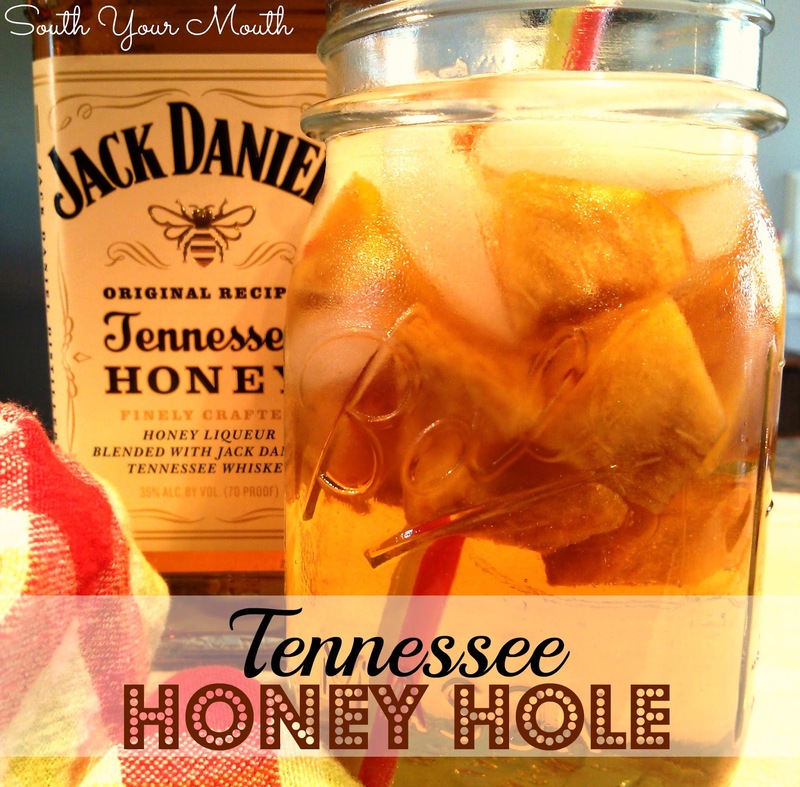 Fill glass with ice then add Jack Daniels Tennessee Honey and ginger ale. Stir then serve. You can play around with the quantities to suit your taste. Combine water, sugar and peaches in a medium saucepan and bring to a boil. Reduce heat to low and stir until sugar is dissolved. Remove from heat, cover and cool to room temperature. As mixture cools, periodically mash peaches with a wooden spoon to release juices and flavor. Strain syrup using a mesh strainer or cheese cloth, cover and refrigerate until ready to use. I'm not really a drinker, many moons ago I was, but not any more. I usually went for the "girlie" drinks or when I was in my "mood" I'll drink anything with rum in it. The girls are into beer big time and vodka's and gin, still are, that's why I'm the designated driver now. This will be something they'll want to try out, it is Jack Daniel's after all, they never say no to Jack! Our next get together will have the Tennessee Honey Hole for the girls to enjoy! I don't "do"whiskey, I'm like you, I'm a beer drinker, or wine. But, I've seen this advertised and wondered about it. And this concoction sounds heavenly! Can you use another fruit other than peaches? Maybe pineapple? I'm not a JD girl but I love Crown Royal so I bought a small bottle of the JD Honey to give it a try. Then I was too lazy to make the simple syrup so I used Peach Schnapps. DELISH. This is like one of those warm evening sipping drinks!!! Thanks for all your great research!!! BTW loved you on the FN show. Had to chuckle when you said "South Your Mouth". I think Cat Cora made a HUGE mistake letting you go!!!! Oh well, bigger and better things are out there for you!!! I think we must have been separated at birth! I love trying your recipes, they are always so good. I am also a beer drinker with a margarita thrown in every once in a while, but this recipe seems to be calling my name because I so love peaches. I will be giving it a try! Where can you find Peach Syrup?